I’ve got two editions of this book – recent gifts from Swedish friend Iwan. An American edition, 1933 plus the first UK edition, 1949, and the dust jacket is from the latter. 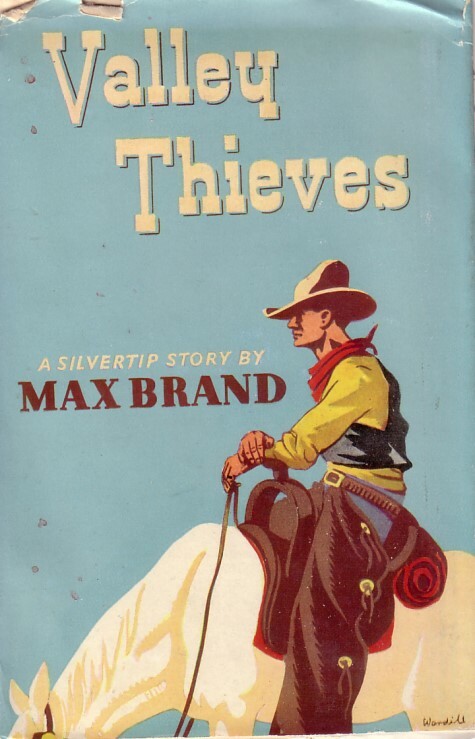 While I’ve read a number of Max Brand books, I haven’t read any of his Silvertip stories, so this is a first for me. 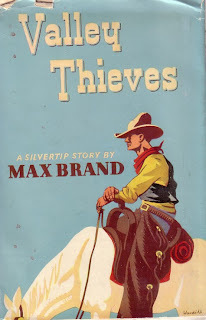 Narrated in the first person by Bill Avon, it relates Jim Silver’s continuing battle of wills and wits with his arch-enemy Barry Christian, in the process of which Silver’s wolf Frosty and his powerful horse Parade are abducted. We also meet the enigmatic Harry Clonmel, another bigger-than-life character. There’s no indication when the story takes place, though a few references may suggest the mid-1890s. Silvertip’s pal Taxi seems to have a penchant for modern inventions; he owns an automatic pistol (1893) and carries an electric pocket torch (the first 2-candlepower lantern, weighing in at 2lb would make his pocket very heavy; invented 1892; the tubular torch, 1898). The evil Barry Christian has a concealed derringer up his sleeve, operated by elastic; elastic braid or knicker elastic came out about 1887 while elastic bands were around post-1845. The writing style isn’t particularly great, but Brand delivers on storytelling. Here, he writes about a West where there are good men and true, where even villains seem to possess some humanity. Old Man Cary is the patriarch of a family of bad blood; he’s well drawn and multi-faceted: he reeks evil yet has a sneaking regard for Silvertip. Silvertip – so called because of the ‘tufts of grey hair over his temples, like the beginning of little horns’ – is not an anti-hero but a mythopoeic hero. As Avon says, ‘… a hero is a property of every ordinary man and because of such men as Jim Silver the rest of us stand straighter. He was a man who had never been found in a cruel, mean, or cowardly action.’ These heroes are necessary, even in this day and age. Too often, so-called heroes espoused by the media have feet of clay. Perhaps there’s a need for more honest and true sportsmen, movie stars and politicians around to set examples to the young. Maybe loss of faith has something to do with it, now our world is overwhelmingly secular and acquisitive. Bill Avon said of Silvertip, ‘His faith in me made me strong. Another man’s faith always multiplies one’s own, I think.’ Self-belief and self-worth grow from the influences of others. I came away from a relatively simple western tale with these thoughts, which surprised me a little. Brand doesn’t openly preach, but his tales clearly have a moral tone, which may appear quaint these days, and yet perhaps many of his readers dearly wish to go back to those simpler times. 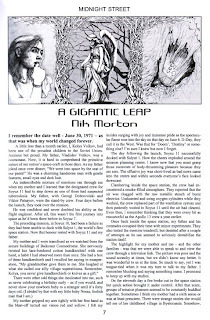 Today, I got a pleasant surprise when I learned that my story ‘A Gigantic Leap’ featured in Midnight Street #13 (Editor: Trevor Denyer)is on the rather long long list of short stories nominated for the 2010 British Fantasy Society’s awards. Those listed are all nominations from BFS members. 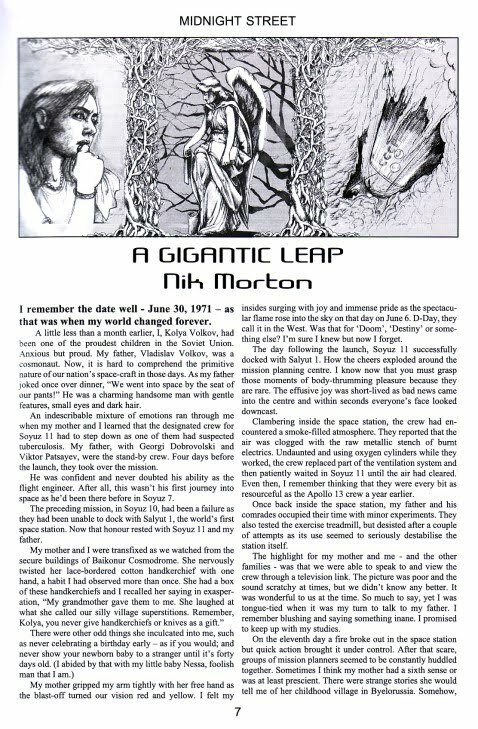 "Nik Morton takes us on 'A Gigantic Leap' as he re-imagines a piece of Soviet history and wonders what might happen if the American paranoia about space-born germs had been justified. It's a gently told story, narrated by an old man who has seen too much in his hard life. Then in the last few paragraphs, the stress and alarm build up nicely. All of the international panic and national security issues occur in the background, though, so as not to spoil the calm flow of the story. It's nicely done." This tale is a particular favourite of mine, so fingers crossed, though it’s up against very stiff competition and several big names. Still, nice to be included. Pictured is the first page of the story from the magazine, with an excellent relevant illustration from Surabhi Wade. Congratulations to Matthew P Mayo for getting his short story 'Half a Pig' (from A Fistful of Legends - Express Westerns) mentioned as a finalist in this year's prestigious Spur Awards. Well done, Matt! which is currently featuring an excellent short interview of Ray Bradbury about his writing schedule. He is an inspiration to all writers - if they half a wit to notice. Write, write and write some more is the way to go. I should know, I've been doing that for 40 years or more! His books are on my shelf and I can still remember so many of his tales, which is he measure of the man and the writer. As Stephen Vincent Benet said, 'A short story is something that can be read in an hour and remembered for a lifetime.' That's Ray Bradbury.